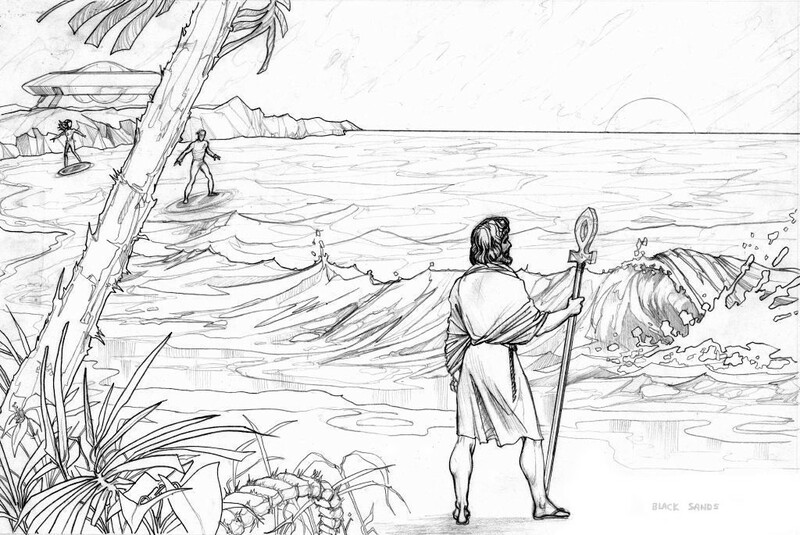 Note: In this Ra Mu-Kalem-Mayleena-Lemurian-Beach-Scene you can see Master Ra Mu thoughtfully gazing out over the sea into the wondrous nature of the multi-dimensional universe, while awaiting the approach of Captain Kalem and Mayleena, and General Harry Faldwell on their personal anti-gravitic flying transport discs. Although you do not see him yet, General Harry Faldwell soon appears leaving the bottom of the Kalem’s Scout ship on another flying disc. Kalem and Mayleena wait for him to catch up with them but he does not quite have the hang of it with his disc wobbling from side to side. He is being escorted to a special meeting with Master Ra Mu, who will show him the true hidden history of events that took place out in our galaxy on other worlds and on ancient Earth that led to this special meeting in a parallel dimension on Earth in present time. What Harry very unexpectedly discovers through his fully conscious out-of-body journey, connected to Ra Mu utilizing his Master Crystal Staff, forever widens his perceptions of himself and the true nature of the grand multi-dimensional universe. Master Ra Mu waits for Captain Kalem, Mayleena, and General Harry Faldwell to approach him. This is also a destined meeting between the fiancees Kalem and Mayleena and this very ancient Master Adept of The Ancient One, who becomes their spiritual mentor, protector, and guide through troubled times ahead. Remarkably, in this Ra Mu-Kalem-Mayleena-Lemurian-Beach-Scene, General Harry Faldwell also discovers the two people that led him to this destined appointment with Master Ra Mu are really not from this world. 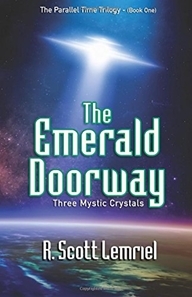 Perhaps, as you journey through The Emerald Doorway (Three Mystic Crystals) hidden truth revealing book chapters you too will begin to remember with certainty you did not originate on planet Earth. In fact, as you explore this book and The Seres Agenda book with the special techniques section located at the back, then you too can utilize them to begin recalling that no human being ever evolved on good old planet Earth in the first place.